A couple of years I wrote about Haskell editor tooling and figured this deserved a bit of an update now that the tooling has become mature. 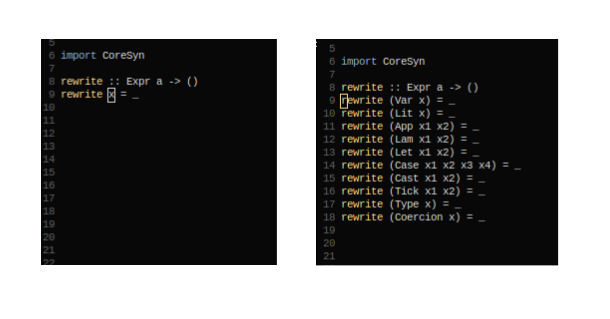 So let’s walk through how we install an minimalist Haskell dev environment on Linux. If you don’t want to build the individual components youself, you can just download the source code. We’ll presume Ubuntu 14.04 as the lowest common denominator, although nothing here is specific to any particular Linux. Obviously first we need to install the world’s greatest text editor, we’ll presume no base vim configuration and build everything from a clean slate. Times have changed quite a bit, and the new preferred way of install GHC in 2016 is to forgo using the system package manager for installing ghc and use Stack to manage the path to the compiler executable and sandboxes. To do this we pull in the FP Complete key and start the build. This will take a few minutes. All is well and we can launch the interactive shell with the latest GHC 7.10 compiler. Pathogen is a bundling system for vim that will allow us to pull directly from Git repos to manage and update our vim packages off of the bundles directory. Using pathogen we’ll install the following libraries. To do this we simply mmove to our bundles directory and pull the repos. The preferred tool for background checking of Haskell syntax is still ghc-mod. Over the years it has become more featureful and more efficient. The hlint tool is also used to supplement and provide helpful hints about ways to refactor common code smells. We will integrate with ghc-mod in several ways, but the first step is to install the command-line tool ghc-mod which vim will send program changes to query information. To install it we use stack. Ok, now to the fun stuff. We’ll set up our basic vim configuration with some pretty sensible defaults that should work nicely in either terminal vim or gvim. Fairly standard stuff here to enable syntax highlighting, line numbers, tab completion and two space indentation. The last line enables the pathogen manager which pulls all the bundles into the environment. The best syntax highlighting that I know of is maintaind under the vim-scripts project on Github. We’ll download it and place them into ~/.vim/syntax/. Syntactic provides background syntax checking with line-by-line error reporting. It integrates with ghc-mod and hlint to provide semantic hinting about type errors and possible code corrections. To enable it we add the following lines to our .vimrc. Now when a syntax error, type error, or code smell is introduced the left gutter will highlight the line and show the error message from GHC in the status line. For example a syntax error. 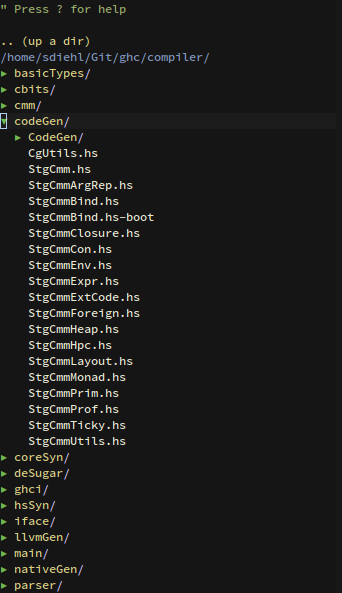 To hook into GHC’s code competion capabilities we map several keyboard commands to ghc-mod functions. To query the type of a subexpression we highlight any term and type t + q to get the type of value under the cursor. To enable familiar tab completion we configure supertab to dispatch to neco-ghc’s tab completion routines instead of the usual local variable completion. After that we configure necoghc to be the default tab completion method. So now pressing tab while in a LANGUAGE pragma, import statement, or anywhere in a subexpression will use neco-ghc’s tab completion routines to find the context appropriate statement that matches the partial expression under the cursor. Nerdtree is the standard file management plugin which replaces vim’s default left-hand file pile. It allows recursive directory traversal with folds and slew of other convenient features. It’s usually one of the first things installed in any respectable vim installation. Tabularize allows uniform aligned code formatting based on any textual regex pagttern. For Haskell there are several common identifiers that we typically align on; and we can map specific keys to these common patterns. For example typing a + - on the case arm branches will align on the right arrow. The best Haskell snippet collection that I know of is one I’ve curated over the years, that automates the insertion of many common insert statements, language extensions and instance declarations. This is placed in the ~/.vim/snippets folder. Then tab completing on the this phrase in Insert Mode will expand out the code block. Ctrl-p is a fuzzy file search plugin which allows quick browsing of a project based on a fuzzy text search of the filename or it’s contents. We’ll bind the ctrl-p panel launch to \ + t.